I was born fourth in a row of girls in a Chinese family, and the first-born boy came after me, so I grew up without much attention from my parents. In fact, I don’t have many recollections of my father when I was young because he was always not around. He never took me to the park or the movies. But one night, when I was six years old and running a very high fever, I remember my father carrying me wrapped in a blanket to the hospital. It’s the first time I can remember his arms being around me. I guess this meant he cared for me. My teenage years brought conflict into our relationship. As I got involved in student demonstrations and social justice causes, my father often threatened that he would disinherit me if I continued my activism. None of my other seven siblings suffered this fate. Even if I did things behind his back, he somehow found out about it. Back then I wondered if he had people tailing me. Many years later, he confessed to being one of the financiers of the underground movement during the martial law years. Perhaps he was just looking out for my safety. I guess this meant he cared for me. He insisted that I work for one of his companies, despite my own insistence that I wanted to do it on my own. In the end, he won out because nobody wanted to hire or invest in a competitor’s daughter. Our working relationship was good, and he soon began to trust my decisions and instincts. I, on the other hand, had grown up, and was now fully involved (and liking it) in running the bank he owned. I saw my father in a different light–his quick mental prowess, his shrewd business sense, his charm and graciousness as a host and negotiator, his witty and engaging comments, his compassion for his employees and their families, his nationalism and patriotism to the country that he loved. The nine years I worked at the bank were the closest and most meaningful times I spent with my father, and it didn’t matter that most of the time we were talking shop. By listening to my ideas and sometimes implementing them, I guess this meant he cared for me. I moved to America in 1982, and our relationship moved to a different phase. I didn’t see him that often, and my life was going in a totally different direction. I have to say though, that despite this, my father never let me down when I asked for help. It is because of him that Filipinas Magazine was borne and lasted thirteen years. I guess this meant he still cared for me, even if I was thousands of miles away from him. In 1998, my half sister Lenny died. She was my father’s favorite, and he was devastated. Not one to show his emotions, he had a difficult time coping with Lenny’s death. He was stationed in Tokyo at the time as the Philippine Ambassador. One day after the funeral, I was surprised to receive a call from him asking me to come to Tokyo. He needed to talk about Lenny, and I was close to her. He also needed comforting. I was never jealous about their relationship; this time though, he cared enough to look for me, and I felt special. From then on, we became friends and confidants, something I never thought could happen between a father and his daughter. 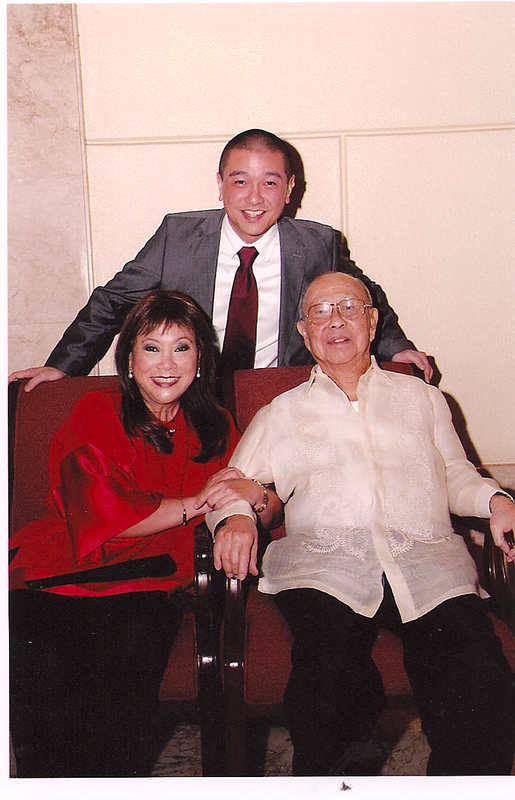 When my stepmother was diagnosed with cancer in 1999, my father called me and asked me to come to Manila to keep him company. He said he was very depressed and needed to laugh. I left right away with a list of jokes I thought he would like. I did this for three months in a row, staying a week at a time, with jokes in hand and telling these to my father. When my stepmother died, I stayed with him in his house. He didn’t have to ask me. I just knew that he needed me there because he cared and needed caring. My father turned ninety last February. His health is good for a man his age, as his ailments have been kept in check with constant medical attention. He’s walking slower, and someone has to hold him to make sure he doesn’t trip. He still goes to the office every day and travels to the U.S. every year. His memory is fading, though, and you have to constantly remind him or repeat your answers. Every now and then I will tell him an old joke and he will still laugh. He forgets he has heard it before. I want to tell him, “Don’t worry, Dad, I am 27 years younger than you, and I will remember for you (for as long as I can).” It saddens me that we can no longer have meaningful conversations; but he is alive and being with him is all that matters now, so I visit him at least twice a year. He has asked me to “come home” for good. Now I know he really cares for me. Happy Father’s Day, Daddy. Thank you for loving me. I will always cherish and remember our memories as these will comfort me in my later years. I love you.